The Community Orchard Project and the village Sustainability Group are having a joint event at the Orchard. Juicing Days are very simple: bring surplus apples from your garden and leave with fruit juice. It’s suitable for all ages and a popular activity with children. 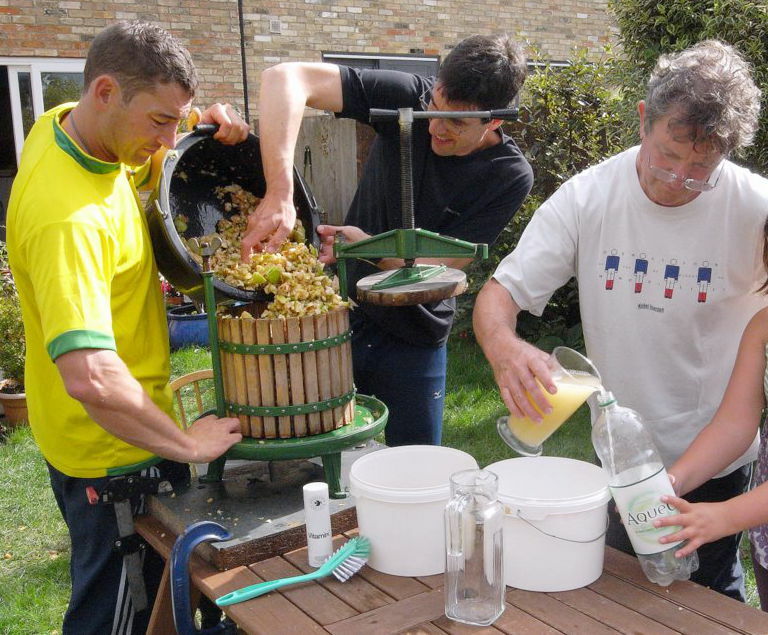 There will be a small production line going so you can take part in each stage of making juice; from washing the apples, preparing them for the juice press and finally turning the press and filling your containers. The juice can be frozen if you want to keep it longer than a few days. A kilo of apples makes roughly 250cls of juice but will vary according to the variety as will the flavour. If the apples in your garden are a bit of a mystery, we’ll have someone there to try and identify the variety for you. This year there will also be the chance to make your own smoothies using pedal power, courtesy of Pulp Friction. Talk to a variety of experts about all kinds of things – from composting systems to keeping your own chickens. There will be representatives from the Community Allottment too if you want to find out more about how that works. There will also be a surplus stall where you can swap or donate your excess fruit and vegetables. The Sustainability Group will have a stand so you can find out what other activities are going on around the village – from the hugely popular Repair Cafes to wildflower planting in the hedgerows. If you want to find out what you can do for nature there will be representatives from the Wildlife Trust offering advice on food plants for garden wildlife. HICOP will have a stall providing tea/coffee and cakes and there will be other food stalls too. With quizzes, information about the carbon footprints of foods and juicing activities for the children there will be lots to see and do. Entry is free, but donations to the orchard are always appreciated. If you would like to help with any of these events, or with any other HICOP work, please get in touch.